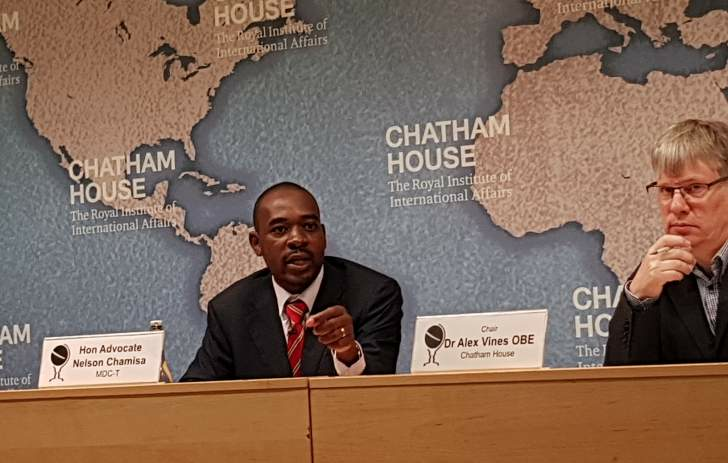 Speaking at Chatham House in London on Tuesday, Chamisa expressed concern over what he said was the inclination of the British government in Zimbabwe "to align with one political party against another." "We have seen that there has been a bit of a shift on the part of the British government in terms of focusing more on political stability and trade and commerce at the expense of democracy. But that is a false narrative, you can never have stability without democracy," he said. "We expect Britain and the EU to speak for free and fair elections. There's a very disturbing trend in the context of the British government in Zimbabwe. We're seeing the inclination to align with one political party against another. That is disturbing, particularly in terms of the issue of just setting the basic standard for free and fair elections. "Because for a long time, the British government has been emphasising norms, values - let those norms and values of free and fair elections be respected. That is all we want - we're not asking for money. We're asking for the solidarity of a global coalition for free and fair elections," he added. Under the New Labour administration from 1997 to 2010, Britain maintained vocal criticism of human rights abuses and violations of the rule of law in Zimbabwe as part of what it called an 'ethical foreign policy'. However, with the return of the Conservative party to Number 10 Downing Street, Britain has focused more on re-engagement to promote business and stabilise the economy rather than advance democracy. This has earned vicious criticism from opposition voices. PDP President and MDC Alliance partner, Tendai Biti, who is travelling with Chamisa, called out the current British ambassador to Zimbabwe, Catriona Laing, in 2016, accusing her of supporting the then-Vice President Emmerson Mnangagwa's presidential ambitions. "[They] are arguing that Zimbabwe needs a strongman. By that they mean a man called Emmerson Mnangagwa, who suddenly is a reformer," Biti charged at the time. However, Britain's apparent shift of policy from an emphasis on human rights to business is not only confined to Zimbabwe. In February this year, the state-run media in China commended British Prime Minister Theresa May, during an official visit to that country, for sidestepping human rights issues in favour of ‘pragmatic collaboration' with China.